Casey Everett's organic cotton creations are a favorite among backyard chicken farmers. What do you give the person who has everything, including backyard chickens? How about a chicken pillow? 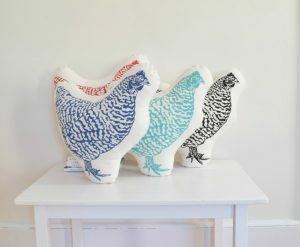 Casey Everett, who lives in Rockport and teaches art at the Islesboro Central School, makes these huggable chickens – and a whole barnyard of other animals – by hand, using certified organic cotton grown in Texas and woven in South Carolina, water-based inks and recycled fiberfill. Her husband does the screenprinting from designs she makes, and then she stuffs and sews the pillows. Don’t care for chickens? Casey Everett has many more animal pillows for those not fond of fowl. Everett grew up on a dairy farm in Winslow, surrounded by woods and fields. She started her business, called Hearth and Harrow, by making nature-inspired home goods for her family. “My two little boys love nothing more than stuffed animals and pillows,” she said, but she wanted to be sure that what they held close and played with was eco-friendly and nontoxic. Then she started making things for friends as well. The business is now located in Everett’s backyard barn studio in Rockport, where she produces certified organic cotton cloth napkins decorated with woodland ferns, chamomile, sea shells and cormorants; tea towels with lavender, birch, calendula flowers, pine cones and oysters; and her animal pillows. Her towels and napkins meet the Global Organic Textile Standard, which means they are not only organic but also sweatshop-free. The fabric she uses “almost smells like hay,” she said. If you’re not into chickens, Everett designs pillows with images of cats, foxes, bears, squirrels, porcupines, otters and other animals. Her sweet little deer, curled up for a nap, would be a perfect addition to a child’s room. Everett has also made a sloth, which is apparently a thing with children these days, and an axolotl, or Mexican salamander. She says her next four pillows will feature a goat (a request from her 5-year-old), a crow (Everett calls it her “spirit animal”), an octopus and a harbor seal – a frequent request from Rockport locals, in honor of the town mascot, Andre the Seal. Everett’s pillows, which range in price from $28-$52 (the chicken is $36) can be purchased through hearthandharrow.com, Amazon Marketplace, and at eight locations in Maine: West Elm in Portland, Found in Kennebunk, Bell Farm in York, L.L. Bean in Freeport, Long Winter Soap Co. in Waldoboro, Minka in Kennebunkport, the Center for Maine Contemporary Art in Rockland, and Elements Arts Gallery in Bethel.